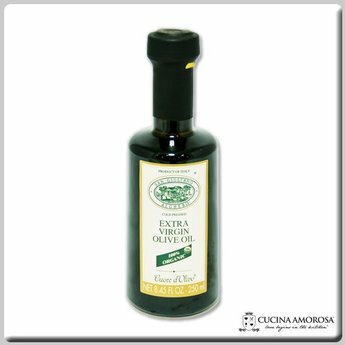 ORGANIC OIL San Giuliano Organic Extra Virgin Olive Oil is produced under the direct control of the ICEA (Ethical and Environmental Certification Institute). Since the early 1990s, all the San Giuliano olive groves have been cultivated using organic methods to promote rural sustainability. OLIVE VARIETIES Bosana, Semidana, Frantoio, Leccino, Coratina. ORIGIN 100% Italian. PROCESS OF TRANSFORMATION The carefully-selected olives are cold processed in the companys mill using granite millstones and grinders allowing for a slow and regular breaking without significantly increasing the temperature of the paste. Continuous cycle system, natural decanting without filtering. SENSORY CHARACTERISTICS Slightly intense golden yellow colour with light green hues. Medium-intense fruity aroma with aromatic herbs and ripe apple tones. A decisive full, sapid taste with well-balanced spicy tones. HOW TO USE Excellent on fish carpaccio, roasted fish, matured cheeses, mushroom or lentil soups, roasted red and white meats, perfect on a walnut, gruyere and cherry tomato salad.